Hoping for a “spike” in donations, we’ve stepped up our giveaway game this year by obtaining a certified, Gronkowski-signed football from the Patriots to auction off to the highest bidder. As many of you know, I’m a full-time employee of the five-time Super Bowl champs. As such, I personally know the fine folks in our community relations department. It is their job (among other things) to arrange for players to sign pieces of authentic team merchandise. These are then set aside specifically for reputable charitable organizations like Nutmeg to use in their fundraising campaigns. Each item comes with a certificate of authenticity as well (see photo), but you can further trust that Gronk indeed signed our football because of my personal connection to the club. So, how can you try to win it? Between now and Friday, October 26, 2018 (the date of our Third Annual Autumn Wine Tasting, when we’ll announce the winning bid), please fill out the form below to make an initial $25 donation. This grants you entry as a bidder in the silent auction. In the space provided on the donation form, indicate the amount that you’re interested in bidding on the Gronk football by writing your first and last name and your bid amount. Important: You will only be charged $25 at this time. If your bid ends up being the highest, you will then be asked to pay your additional bid amount. As a guide, a quick online search will show you that similar items can fetch several hundred dollars, so, please try to bid accordingly – and generously. Remember, if yours is the highest bid, all proceeds will benefit Nutmeg Animal Welfare– not some for-profit sports memorabilia dealer’s pockets. Again, a $25 donation is required to enter the auction, and you’ll only be required to pay your bid amount if it ends up being the highest. But even if you don’t win the Gronk football, you can feel good that you made at least a $25 financial gift to Nutmeg, which helps support our ever-growing worldwide efforts to care for needy animals everywhere. I’m making the auction available to Patriots fans everywhere. So, you need not be present at the Third Annual Wine Tasting to enter, but, certainly, if you’re able to attend, we’d love to see you there as well. In the meantime, thanks in advance for your contributions, and good luck to everyone! If you have any questions or alternate requests please email info@nutmeg.global or contact us. Enter your silent auction amount. 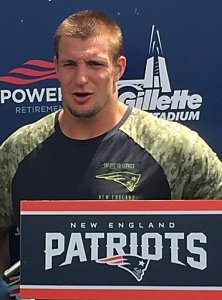 By making this $25 gift to Nutmeg Animal Welfare, you are now qualified to enter our silent auction for an NFL football autographed by Patriots star Rob Gronkowski. In the field below, please write [Your First & Last Name] bids $ [___]” to let us know your bid amount, keeping in mind that similar items can sell for at least several hundred dollars. Then, fill out your credit card details below to complete your donation. IMPORTANT: You will only be charged $25 at this time. If your bid amount ends up being the highest in the auction, which concludes Friday, October 26, 2018 during our Third Annual Wine Tasting event, you will then be asked to pay that winning bid amount in order to receive the football. Thank you for participating, and good luck in the auction!